The state of California helps school districts and community college districts pay for construction projects. Districts can apply for state money, but usually have to contribute some of the money themselves. The state usually pays 50 to 60 percent of school construction costs. Money for these projects is separate from money used to hire teachers or pay for educational programs. Since 1998, state bonds have provided a total of $36 billion for K-12 facilities and $4 billion for community college facilities. Allow the state to sell $9 billion in new bonds for educational facilities. $7 billion would be marked for K-12 public school facilities and $2 billion for community college facilities. School districts could apply for funds to buy land, repair old buildings or construct new facilities. The money from Prop 51 could not be used to hire teachers or pay for educational programs. The total cost to pay off the bonds plus interest would be $17.6 billion. Payments of about $500 million would be made each year for about 35 years. Many of our schools need repairs and upgrades to make them safe for our children. Prop 51 will improve education overall and help expand space at community colleges so more students can attend. Prop 51 would add to the state’s debt, which is already more than $400 billion. Bond measures should be passed locally, giving communities control of how money is spent. Should the state sell $9 billion in general obligation bonds to be used for upgrading public education facilities? The state funds school projects through general obligation bonds, all of which must be approved by voters. During 1998-2006, voters approved $40 billion of such bonds. The state’s 2016-17 payment to service debts from those previous bonds amounts to $2.4 billion for K-12 schools and $300 million for community colleges. Virtually all of the funds from those previously-issued bonds have been spent. Under the state’s existing School Facilities Program, schools submit project proposals to the state. The proposals may be to buy land, construct buildings, and/or renovate existing buildings. In most cases, schools that receive state funding must contribute local funding. Local funding is either 40 or 50 percent of project costs, depending on the type of project. Schools that lack sufficient funding may apply for additional grant funding, up to 100 percent of the project cost.There is no similar grant funding structure for community colleges. School and community college districts may sell local general obligation bonds to help cover the cost of facility projects, which also must be approved by local voters. Since 1998, school and community college districts have sold about $64 billion and $21 billion, respectively, in local general obligation bonds for facility projects. Prop. 51 would authorize the state to sell $9 billion in general obligation bonds: $6 billion to modernize old, or to construct new, K-12 public school facilities; $2 billion for community college facilities; and $1 billion for charter schools and vocational facilities. The state likely would issue these bonds over a period of about five years and make payments from the General Fund over a period of about 35 years. If the bonds were sold at an average interest rate of five percent, the total cost to pay off the bonds would be $17.6 billion, including principal and interest. The average payment per year would be about $500 million, less than half of one percent of the state’s current General Fund budget. Given the availability of additional state funds, some local school and community college districts might raise and spend more locally, while others might raise and spend less locally. A statewide bond is the best option for meeting California’s school construction needs. Local voters will still be in control of how the bond funds are spent. Many schools and community colleges throughout the state have outdated facilities and need repairs to meet basic health and safety standards. Local school bond measures work better than statewide bonds. Local control is the best way to minimize government waste. Prop. 51 funding would go to those first in line. Large, wealthy districts would receive the lion’s share of funding, because they have the resources to quickly apply for the funding. State costs of about $17.6 billion to pay off both the principal ($9 billion) and interest ($8.6 billion) on the bonds. Payments of about $500 million per year for 35 years. California Has 8.3 Million Students Enrolled in Public K-14 Education. The public school system from kindergarten through grade 12 (K-12) currently has about 6.2 million students, 10,000 schools (including 1,100 charter schools), 950 school districts, and 58 county offices of education. The California Community Colleges currently have 2.1 million students at 113 campuses operated by 72 community college districts. The community colleges offer courses in English, other basic skills, and citizenship, as well as provide workforce training, associate degrees, and preparation for transfer to universities. K-12 Public School Facility Projects Approved Through State Review Process. Under the state’s existing School Facilities Program, schools submit project proposals to the state’s Office of Public School Construction. The project proposals may be for buying land, constructing new buildings, and modernizing (that is, renovating) existing buildings. Schools are eligible for new construction funding if they do not have enough space for all current and projected students. Schools are eligible for modernization funding for buildings that are at least 25 years old. Program Based Upon State and Local Partnership. In most cases, schools that receive state grant funding for approved projects must contribute local funding for those projects. For buying land and new construction projects, the state and local shares are each 50 percent of project costs. For modernization projects, the state share is 60 percent and the local share is 40 percent of project costs. If schools lack sufficient local funding, they may apply for additional state grant funding, up to 100 percent of the project cost, thereby reducing or eliminating their required local contributions. A Few Special Program Components for Two Types of K-12 Facility Projects. Most of the basic program rules apply to career technical education and charter school facilities, but a few program components differ. Although the state pays 60 percent of project costs for most modernization projects, it pays 50 percent for career technical education and charter school modernization projects. (Shares for new construction are the same.) For career technical education, state grants also are capped at $3 million for a new facility and $1.5 million for a modernized facility. For charter school projects, proposals also must undergo a special state review to determine if the charter school is financially sound. In addition to these special rules, schools that cannot cover their local share for these two types of projects may apply for state loans (rather than additional grant funding). Schools must repay their career technical education loans and charter school loans over maximum 15-year and 30-year periods, respectively. Community College Facility Projects Approved in Annual Budget. Though community colleges also may receive state funding for buying land, constructing new buildings, and modernizing existing buildings, the process for submitting and approving projects is different than for K-12 facilities. To receive state funding, community college districts must submit project proposals to the Chancellor of the community college system. The Chancellor then decides which projects to submit to the Legislature and Governor, with projects approved as part of the state budget process and funded in the annual state budget act. Local Contributions Vary for Community College Facilities. Unlike for K-12 facilities, state law does not specify certain state and local contributions for community college facilities. Instead, the Chancellor of the community college system ranks all submitted facility projects using a scoring system. Projects for which community colleges contribute more local funds receive more points under the scoring system. State Retires Bonds Over Time by Making Annual Debt Service Payments. In 2016-17, the state is paying $2.4 billion to service debt from previously issued state general obligation bonds for school facilities and $300 million for community college facilities. Districts Raise Local Funding for Facilities Mainly Through Local General Obligation Bonds.School and community college districts may sell local general obligation bonds to help cover the cost of facility projects. Districts must get at least 55 percent of their voters to approve the sale of these local bonds. Since 1998, school and community college districts have sold about $64 billion and $21 billion, respectively, in local general obligation bonds for facility projects. A Few Other Local Funding Sources. In addition to local bonds, school districts can raise funds for school facilities by charging fees on new development. Since 1998, school districts have raised $10 billion from developer fees. (Community colleges do not have this revenue-raising option.) School and community college districts both can raise local funding for facilities using various other methods, including parcel taxes, but they use these other methods much less frequently. 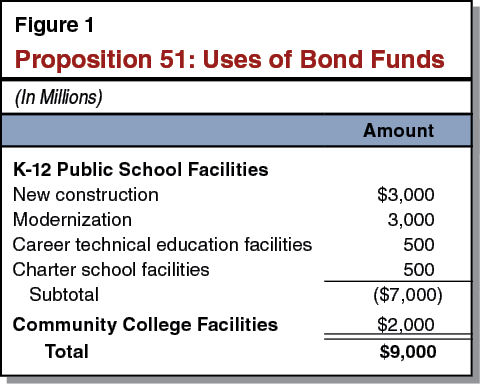 As shown in Figure 1, this measure allows the state to sell $9 billion of general obligation bonds for public school and community college facilities. K-12 School Facilities. As shown in the figure, the $7 billion for K-12 school facilities is designated for four types of projects: new construction, modernization, career technical education facilities, and charter school facilities. The rules of the state’s existing school facility program would apply to these funds. Community College Facilities. The $2 billion community college funding is for any facility project, including buying land, constructing new buildings, modernizing existing buildings, and purchasing equipment. Consistent with existing practice, the Legislature and Governor would approve specific community college facility projects to be funded with the bond monies in the annual budget act. Measure Would Increase State Debt Service Costs. The cost to the state of issuing the proposed bonds would depend on the timing of the bond sales, the interest rates in effect at the time the bonds are sold, and the time period over which the bonds are repaid. The state likely would issue these bonds over a period of about five years and make principal and interest payments from the state's General Fund (its main operating account) over a period of about 35 years. If the bonds were sold at an average interest rate of 5 percent, the total cost to pay off the bonds would be $17.6 billion ($9 billion in principal plus $8.6 billion in interest). The average payment per year would be about $500 million. This amount is less than half of 1 percent of the state’s current General Fund budget. Measure Would Have Some Impact on Local Revenue-Raising and Facility Spending. Passage of a new state bond would likely have some effect on local district behavior. This is because school and community college districts typically are required to make local contributions to their facilities if they want to obtain state funding. The exact effect on local behavior is uncertain. On the one hand, some school and community college districts might raise and spend more locally given the availability of additional state funds. As a result, more overall facility activity might occur in these districts over the next several years. In contrast, other school and community college districts might raise and spend less locally as the availability of additional state funds means they would not need to bear the full cost of their facility projects. These districts might complete the same number of projects as they would have absent a new state bond. They would use the newly available state funding to offset what they otherwise would have raised locally. The state could sell $9 billion in general obligation bonds for education facilities ($7 billion for K-12 public school facilities and $2 billion for community college facilities). The state would not have the authority to sell new general obligation bonds for K-12 public school and community college facilities. PROP. 51 MAKES PROTECTING STUDENTS A TOP PRIORITY. Many schools and community colleges are outdated and need repairs to meet basic health and safety standards—including retrofitting for earthquake safety, fire safety, and removing asbestos and lead paint and pipes. Prop. 51 will help make sure our local schools are updated and safe for students. WE CAN’T WAIT ANY LONGER. We haven’t passed a statewide school bond in ten years, and now we face a massive backlog of local school projects. Our schools are in desperate need of upgrades and repairs to keep our students safe and ensure they have facilities where they can learn. Prop. 51 will help our students and veterans succeed. PLEASE JOIN US IN VOTING YES ON PROP. 51. UNAFFORDABLE: Californians already pay $2 billion each year on state school bonds. Proposition 51 would cost an additional $500 million each year—money the state doesn’t have. In total, California has over $400 billion in debt and financial commitments. Governor Brown calls this a “wall of debt.” Borrowing more money we can’t afford is reckless. UNACCOUNTABLE: With local school bonds, communities control spending. With state school bonds, bureaucrats and their cronies call the shots. Local control is the best way to minimize government waste. UNNECESSARY: For school construction, local bond measures work better than statewide bonds. Last June voters approved over 90% of local school bonds on the ballot, providing over $5.5 billion for school construction. School enrollment is expected to decline over the next 10 years. Proposition 51 wastes money favoring construction of new schools over remodeling existing schools. INEQUITABLE: Proposition 51 funding would go to those first in line. Large wealthy districts would receive the “lion’s share” because they have dedicated staff to fill out paperwork. This shuts out smaller, poorer districts that need help most. This is morally wrong. Proposition 51 is supported by businesses and politicians who benefit from more state spending. Yes on 51 has already raised over $6 million from those who would profit most, including the Coalition for Adequate School Housing (CASH) and California Building Industry Association. California Taxpayers Action Network is an all-volunteer, non-partisan, non-profit that promotes fiscal responsibility and transparency in local government. We combat government secrecy, waste and corruption and seek to ensure everyone receives good value for their tax dollars. We’re people just like you who support quality schools and want fiscal responsibility in government without waste. Join us in voting NO on Proposition 51. Because spending safeguards are not implemented or not working bond funds can be misused. Both Governor Jerry Brown and Attorney General Kamala Harris have raised this concern. Prop. 51 keeps this flawed system in place. Prop. 51 ties the hands of legislators and locks in current rules. It hijacks our democracy by barring legislators from correcting rules that deny disadvantaged schools the help they need. This guarantees developers don’t pay their fair share. Bonds are expensive. Two tax dollars are required to payback every dollar borrowed. Bonds should be used for things that last decades. Incredibly, Prop. 51 funds can be spent on equipment with a 10-year “average useful life.” Bond payments will last decades longer. This is like buying your lunch with a 30-year mortgage and paying for it many times over. Prop. 51 may be the most self-serving, devious measure ever put before California voters. It was created by the construction industry to benefit the construction industry. Visit StopProp51.org. See who’s behind the Yes campaign. Prop. 51 ensures that every California student has the opportunity to learn in safe, up-to-date schools while also protecting taxpayers. PROP. 51 IS NOT A TAX INCREASE. Prop. 51 is a bond that will be repaid from a very small amount of the state’s EXISTING annual revenue to repair and upgrade local schools. It does NOT raise taxes. PROTECTS TAXPAYERS FROM HIGHER LOCAL TAXES. Without matching dollars from a statewide school bond, taxpayers will face higher local property taxes to pay for school repairs and upgrades, and some school districts may never be able to afford fixing schools on their own. This partnership between the state and local school districts has fairly funded school repairs for all students. Prop. 51 puts local voters in control of how school bond monies are spent. It requires annual audits and tough accounting standards. PROP. 51 MAKES PROTECTING STUDENTS A PRIORITY. Many schools and community colleges are outdated and need repairs to meet basic health and safety standards— including retrofitting for earthquake safety, fire safety, and removing asbestos and lead paint and pipes. These repairs are critical to keeping every student safe. Prop. 51 will help every California student get a quality education, increase access to an affordable college education, and improve vocational training for veterans and students preparing for the workplace. Please join us in supporting Prop. 51.